With the release of Warmind and Destiny 2’s shift into Season 3, Bungie has released a new way to gather items from Eververse without having to shell out Silver. 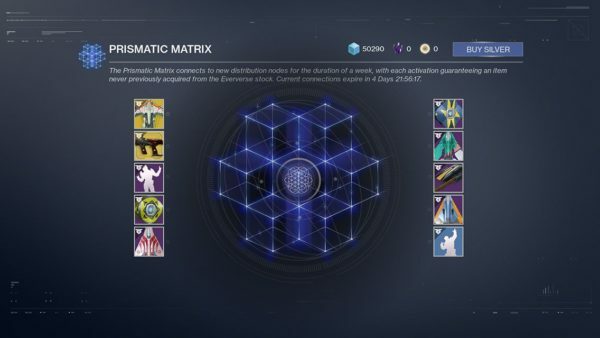 A image of the Prismatic Matrix from the inaugural week of Warmind. The Prismatic Matrix is another way to earn free items from Eververse, Destiny 2’s in-game store. The premise is fairly simple. Each week, it “connects to new distribution nodes”, which shuffles its inventory with new items. Every item will be unique, and duplicates are confirmed to be disabled, so every roll of the Matrix will give you something new. To actually use the Prismatic Matrix, you have two options. One works the same way as the Bright, Illuminated, and Prototype Engrams players earn on leveling up, while the other involves purchasing Silver. The primary way that many people are going to be using this will be by earning their free weekly Prismatic Facet. 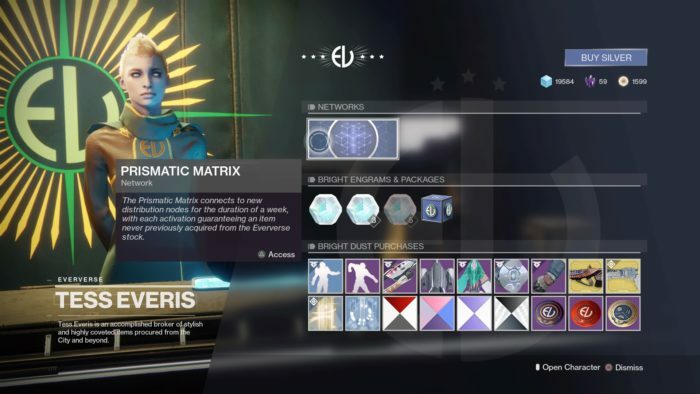 This is the item that allows players to activate the Prismatic Matrix, earning one of the ten items shown they have not previously obtained through the Matrix, Eververse, or Engrams. You are confirmed one of the ten items that you do not already own, but what you earn is randomly selected from that pool. If you’re looking for more Destiny 2 guides, check out our wiki.